You can see how I got on after the gallery, a brief set of coffee-related highlights from my two weeks in Florida. An interesting fact: it takes about 10 hours to fly from London to Miami. It takes about 11 hours to fly from London to Phoenix. And it takes a highly unreasonable 4½ hours to fly from Miami to Phoenix. They really are a very, very long way apart! The only airline to fly direct between the two cities is American, with whom I’ve had mixed experiences. My transatlantic flights with American have been fine, both from London and from Manchester. However, two of the flights I took on my cross-country trip this time last year were with American, the one to Miami from Chicago, which was okay, and the one from Miami to Boston, which was anything but. However, unless I wanted to spend even longer travelling, and have the hassle of changing planes in the middle, American was my only option, so American it was. Either way, I’d have the pain of a very long day, with the choice of taking my pain in the morning or the evening. In the end the price made my decision for me, with the morning flight being the cheapest by a considerable margin. Any guilt I felt over contemplating first class soon evaporated when I looked at the price in detail. By the time I’d added the baggage fee ($25) and another $50 for an exit row seat, economy wasn’t much cheaper than flying first class. Since work was paying for the flight and I had the money in the travel budget, it really was a no-brainer. So, I went ahead and booked it. All that was left to do was get up at ridiculously early o’clock and get to the airport on time. You can see how well I managed that after the gallery. The good news was that from that point on, everything went relatively smoothly. I rolled out of bed, got dressed and left, having checked out the night before. By 5.00, I was on the hotel shuttle to the airport and by 5.10, I was at the American Airlines terminal (did I mention that my hotel was right next to the airport?). Regular (Travel Spot) readers will know that I am no fan of flying from domestic terminals at American airports. I find them busy, inefficient and stressful, much like all other airports, only more so. Miami, in that respect, wasn’t so bad. All American airports now seem to have a system whereby you check-in at a kiosk (even if you’ve checked-in on-line, which I had) to have your luggage tag printed. You then manually attach it to your bag (jamming the machine in the process; so far I’ve jammed three out of three) then queue up to hand it over at bag drop. Just like British airports, only with the unnecessary step of the tag-printing terminal. Despite this, my bag was safely on its way and I was at security by 5.20, a mere 10 minutes after arriving. For all my criticism (whining? ), having spent up to an hour at old-school check-in lines in the past, this is a vast improvement. Security took a bit longer, but then it always does. The queue wasn’t very long when I got there, but it moved slowly since there was only one scanner in operation. 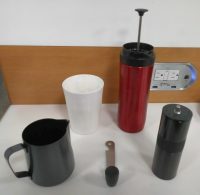 Naturally I got pulled aside for something: this time it was my bags of coffee, my Travel Press (nice metal cylinder) and my scales (the scales rarely get through unscathed so usually travel in my checked bag), although my Aergrind (another metal cylinder) and Therma Cup went unchallenged. Even so, I was out of security by 5.45 and at the gate by 5.50, an hour before my flight was due to leave. Although I was travelling first class, there’s no automatic lounge access for domestic flights, something which I feel is a bit of a con, so I was left to slum it at the gate. One thing I’ve said before in favour of American airports: generally the gate is called well in advance, unlike the UK where you have to hang around in a central area, keeping an eye on the departure boards before scurrying off at short notice. This is something American airports do so much better than UK ones and I wish ours would change. In Miami, I just walked up to the gate and settled down. There was plenty of space, a few power outlets and, most importantly for me, a couple of friendly cafes, one of which was good enough to give me a jug of hot water so I could make some coffee before the flight, a vital consideration since I’d had two hours sleep and had already been up for over an hour! I’d just made my coffee when the flight started to board. We were due to board at 6.20, but boarding started early at 6.15 and since I was travelling first class, I had priority boarding, so quickly packed up my stuff and headed over to my gate. By 6.40, we were all on-board and by 6.50 (on time, woo hoo!) we pushed back from the gate and were on our way. I was flying on an Airbus A321, with a small first class section at the front, just four rows of seats, each with two seats either side of the aisle (compared to three in economy). These are much nicer than your standard economy seat: to start with, they are wider, so you don’t feel as if you are levering yourself in, plus there’s a decent amount of leg room. I could stretch my legs all the way out under the seat in front of me. The other advantage is a large armrest between the seats which doubles as a small table, something severely lacking whenever I’ve flown in economy. The table’s an upgrade too: it folds out of the armrest and is wide, if a little thin. It was big (and stable) enough for my laptop though. Even better, it slides back and forwards, so you can get it at the right distance for typing. Best of all, there’s enough space that even when the seat in front is reclined, I can still use my laptop, although it is very tight. We took off at 7.05 after the customary trundling around on the ground, by which time it was starting to get light. However, once we broke through the cloud (which only took a few minutes), we emerged into bright sunlight. The flight itself was pleasant enough, but there was nothing in the experience that said “first class” to me. Obviously, I’ve been spoilt by flying in business class a few times last year (and will be again this year) but it’s fair to say that the first class cabin was nowhere near as good as business class on a long-haul flight. In fact, it was more akin to premium economy, although with a little more room, particularly when it comes to the width of the seat. It was a similar experience with the service/food, which arrived after about 40 minutes. Breakfast was okay, but rather disappointing: cold slices of fruit, yoghurt and granola. Frankly I’ve had better when flying long-haul in economy. The coffee was drinkable but rather poor and the whole experience was redeemed (but only slightly) by the arrival of a warm biscuit and two warm cinnamon rolls which at least stopped me feeling hungry. The rest of my airport experience was pretty good. Phoenix’s Sky Harbor Airport is one of my favourite (large) airports, not least because it has a branch of Cartel Coffee Lab over by Gates C. I had just enough time to scoot over and have a welcome-back latte in my Therma Cup. So… was flying first class worth it? You can see what I think after the gallery. In what I am about to say, I should confess that I am not comparing like-for-like. I rarely fly short-haul in Europe (the natural equivalent to this flight) and when I do, it tends to be with budget airlines or in economy. So when I compare it to flying, it’s usually to long-haul flights. That said, pricewise, my one-way flight to Phoenix was not much cheaper in first class than it cost me to fly long-haul to Miami and back in economy, so it terms of getting what you are paying for, it’s a fair comparison. That said, nothing about the experience said first class. If I was to give it a name, I’d say “slightly better than economy” class. A better comparison, if you travel by train in the UK, is the difference between standard and first class, where you usually pay a whole lot more for a slightly better seat and a slightly better service, plus a similar level of disappointment. The flight itself was (as I never tire of saying), smooth and uneventful and the service was efficient. I did note that the cabin was quite cold: I had a shirt, waistcoat and jumper on and was comfortable. I felt sorry for anyone who had dressed for the Miami (or Phoenix) weather and was just in a shirt. One unusual thing did happen though. The seat-belt signs came on a few times and the cabin crew actually told people to sit down and stop moving around. That’s the first time I’ve seen that happen on a US carrier. I don’t usually sit this close to the front, so noticed an interesting routine whenever the flight deck door was opened, such as when one of the pilots needed to use the bathroom. There was only one cabin crew in our section, so a second member of the cabin crew would come forward and use the drinks trolley to block off access to the galley from first class. Then the cockpit door opened, the pilot came out and the other flight attendant went into cockpit (presumably so that there’s never a single person on the flight deck at any time). The second flight attendant then stood guard with the trolley until the pilot was safely returned to the flight deck. Fascinating. So, back to the question I posed earlier: was it worth it? Well, since someone else was picking up the tab, absolutely! Had I been paying for it? Maybe. I’m still scarred by my Miami to Boston flight the year before. Had economy been significantly cheaper, I might have risked it, but as it was, I’d have probably bitten the bullet and gone first class. My general takeaway from this, however, is still to avoid flying internally in the US wherever possible! You can see how I got on flying back to the UK from Phoenix in business class. This entry was posted in Brian's Travel Spot, Miami, Phoenix and tagged A321, AmericanAirlines, BusinessClass, USA2018-T01A by Brian Williams. Bookmark the permalink.